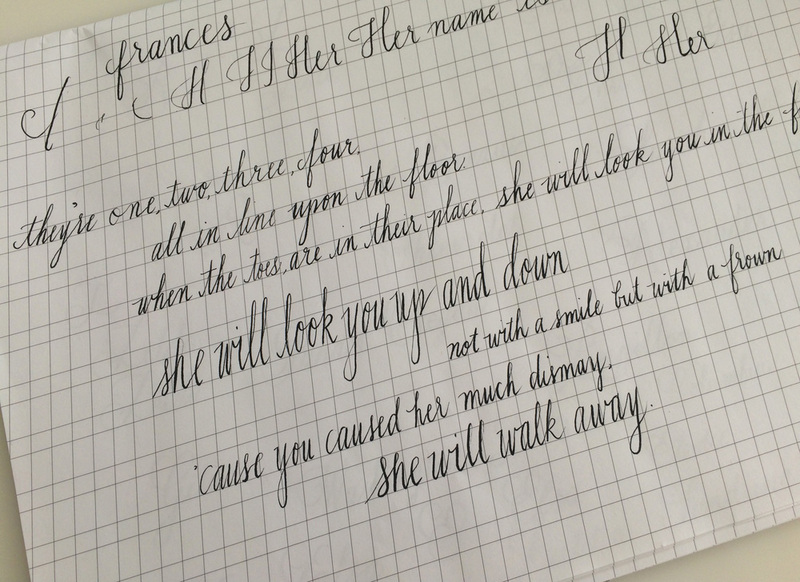 An early practice sheet when I started calligraphy in March 2014. Same words written in June 2016. Washington, D.C. — I find it very instructive to browse through my old practice sheets to see where I was before and where I am now. It's important to keep critical eyes on our work; otherwise, we can never improve. Even though the difference between my lettering then and now is encouraging, I can see that there is a lot more work to do. We can never be perfect, but we can strive to do our best. But of course, it's always good to remember to laugh and have fun along the way. Song lyrics are meant to be sung to the Thomas the Train theme song. My nephew played the song incessantly, so it always got stuck in my head. My husband and I turned what could've been a pesky thing into something useful—lyrics about our cat Frances. Regretfully, this description of her personality is very apt. Frances doing the QC patrol. I think she's telling me to review the top, far right invitation. Washington, D.C. — I was just about to photograph a set of handmade wedding invitations, when along came Frances to review my work. She's the resident QC'er at Handmade Letters. It's her job to hold me to the highest standards—I think I got away easy this time.